Dilgo Khyentse Rinpoche (Tib. དིལ་མགོ་མཁྱེན་བརྩེ་རིན་པོ་ཆེ་, Wyl. dil mgo mkhyen brtse rin po che) (1910-1991) — born in the Dergé region of Kham, Eastern Tibet, Dilgo Khyentse Rinpoche was recognized as the mind emanation of Jamyang Khyentse Wangpo (1820-1892), and was one of the closest disciples of Jamyang Khyentse Wangpo’s activity emanation, Jamyang Khyentse Chökyi Lodrö (1893-1959). Regarded by many as one of the greatest Dzogchen masters of the twentieth century, and the very embodiment of Padmasambhava, Dilgo Khyentse Rinpoche was the teacher of many of the important lamas of today. His Holiness Dilgo Khyentse Rinpoche was born in 1910 in Denkhok Valley, eastern Tibet, to a family descended from the royal lineage of the ninth century King Trisong Detsen. While still in his mother’s womb, he was recognized by the great master Mipham Rinpoche as an extraordinary incarnation. He was one of the last great masters to have completed his entire training in Tibet. He entered Shechen Monastery in Kham, east Tibet, at the age of eleven and there his principal master, Shechen Gyaltsap Gyurme Pema Namgyal, formally enthroned him as an incarnation of the wisdom mind of the first Khyentse Rinpoche, Jamyang Khyentse Wangpo (1820-1892). ‘Khyentse’ combines two Tibetan words: མཁྱེན་པ་, khyen, meaning wisdom, and བརྩེ་བ་, tsé, meaning compassion. In Shechen, Khyentse Rinpoche spent many years studying and meditating in a hermitage above the monastery. He received teachings and transmissions from over fifty teachers from all four lineage traditions. From the ages of fifteen to twenty-eight, he lived in silent retreat, in remote hermitages and caves, actualizing all the teachings he had previously received. Later, he spent many years with his second root teacher Jamyang Khyentse Chökyi Lodrö, also an incarnation of the first Khyentse, who named him his Dharma heir. When he left Tibet and went into exile, he travelled all over the Himalayas, India, southeast Asia, Europe and North America, transmitting and explaining the teachings to his many disciples. He was not only a principal holder of the Longchen Nyingtik lineage of Dzogchen, but a lineage holder of teachings from all schools of Tibetan Buddhism. This, together with his exemplary activity within the non-sectarian Rimé movement, meant that there was hardly a practitioner in the Himalayas who did not receive teachings from him. He was the master of masters — His Holiness the Dalai Lama considers him as his main teacher of Dzogchen — and also became spiritual advisor to the royal family of Bhutan. He passed away in Bhutan in 1991. In addition to his tireless teaching activity, Khyentse Rinpoche supervised an exceptional publishing programme, making available over 300 volumes of teachings. The destruction of so many texts during the early sixties in Tibet meant that by taking such pains to publish them, Khyentse Rinpoche ensured their survival for future generations. Khyentse Rinpoche also initiated a vast building programme. He established his main seat near the great stupa in Boudhanath, Nepal — Shechen Tennyi Dargye Ling, a magnificent monastery with over one hundred monks, now directed by Shechen Rabjam Rinpoche, his grandson and Dharma heir. All the great communal practices and sacred dances of Shechen Monastery in Tibet have been revived, and are regularly performed by the monks who pay particular attention to every detail to make sure the tradition is kept completely pure and authentic. In India, he built a stupa in Bodhgaya, at the site where Buddha attained enlightenment. In Bhutan, he built several temples and large stupas. 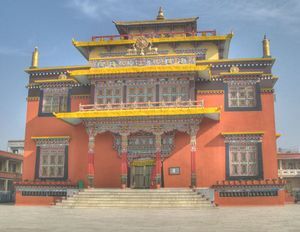 And in Tibet itself, he re-consecrated the monastery of Samye, inaugurated the rebuilding of Shechen monastery, and contributed to the restoration of over two hundred other monasteries and temples throughout the country. In addition to all these achievements, he composed numerous poems, meditation texts and commentaries. He was a tertön, a discoverer of the teaching ‘treasures’ preserved by Padmasambhava. Throughout his life, he showed himself to be a true embodiment of enlightened activity; he would regularly give his attention to several tasks at the same time, and whatever he was doing seemed to flow effortlessly from his view, meditation and action. His teaching and his life were one. His reincarnation, Khyentse Yangsi Rinpoche, was born in Nepal in 1993. Orgyen Tobgyal Rinpoche, Lerab Ling, 21 & 26 July 2010. Tulku Urgyen Rinpoche, Blazing Splendor: The Memoirs of Tulku Urgyen Rinpoche (Boudhanath, Hong Kong, Esby: Rangjung Yeshe Publications, 2005), Ch. 31, 'Brilliant Moon'. Matthieu Ricard, Journey to Enlightenment: The Life and World of Dilgo Khyentse Rinpoche, (illustrated) Aperture, 1996. Also published under the title The Spirit of Tibet. There is also a documentary directed by Matthieu Ricard with amazing footage of Dilgo Khyentse Rinpoche, which shares the same title. This page was last edited on 28 March 2017, at 15:21.